A reader recently posted a comment on a post of mine about fishing which asked: How was the pike by the way? Well, since you ask, the Pike was pretty good, thanks! As I recall, I filleted it, coated the produced steaks with a little seasoned flour, pan-fried them a nice golden brown and then ate them with a squeeze of lemon. It was very tasty. There's a nice bit in Hugh Fearnley-Whittingstall's River Cottage Fish Book where he says something like, 'you want to know what Pike tastes like? Well, it's not like chicken and beyond that, I'm not going to tell you - you'll just have to catch one and find out for yourself'. I agree that landing one and cooking it is the best way to find out, but I think I can say a little more than Mr. Fearnley-Whittingstall about this. It's an interesting fish to eat; the flesh is very firm and white - far more like Tuna than it is like Cod, say - and it has a pleasant flavour all its own; one that's neither very delicate nor overwhelming. It's certainly not a 'muddy' taste - though I've never eaten a lake-caught Pike and I couldn't vouch for them. I've caught all the Pike I've ever eaten from a clean, fast-flowing local river which rises from its source about ten miles away from where I live and passes through no cities or sites of industry on its way to the place where I fish. I'm sure you can catch Pike in English canals but I've never pulled a fish out of a canal and then scoffed it myself; what that would taste like I've no idea. Filleting Pike is rather tricky. Fearnley-Whittingstall suggests that one way around this is just to cook it with the bones in - steaming or roasting - and then separate the bones out on the plate as you eat. I have tried this and it's perfectly OK; the bones are big and easy to spot - but it is still a tad fiddly. This gentleman is filleting a medium-sized Pike but they can, I'm here to testify, grow to truly terrifying dimensions. I was fishing in a deep-water section of another local river last year - just alongside a wide bridge - when my line was abruptly taken out from close to the bank to mid-stream in what seemed like a fraction of a second by an extraordinary force. I was very taken aback - and probably yelped a fair bit - but I did manage to hang on to the rod and the very strong plaited braid I was using didn't break either. The line soon came back to the river bank and then there glided in front of me, just beneath the water and clearly visible, a glaring, furious, monstrous animal I would swear was the size of a fairly generous, full-grown Labrador. Happily, the fish then prompty spat out the lure and swam away to leave me shaking with shock and relief on the river bank. 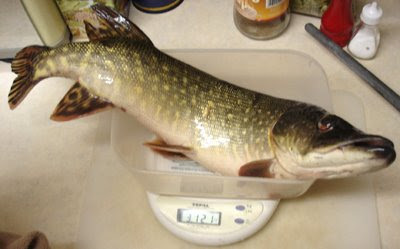 Pike become too tough to make good eating, so I gather, when they get over five pounds in weight and so I've no wish at all to ever catch one that's larger than that. That one - though fishermen's tales must be taken with a little salt I suppose, my own included - was certainly a shade over five pounds.